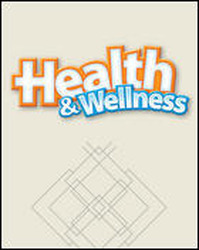 Help your students take a serious look at good health with this high school health textbook. Organized into 70 flexible lessons correlated to the National Health Standards, this program covers such topics as Alcohol, Tobacco, and other Drugs; Mental and Emotional Health; Injury Prevention and Personal Safety; Nutrition and Personal Health; and Physical Activity. Flexible. Skills based. Engage your students with open discussion-based health lessons. Emphasis on developing health skills with activities such as Using Life Skills, Real-Life Application, Responsible Decision Making, and Health Literacy. 70 flexible lessons provided in multiple formats: print student edition, online student edition, and StudentWorks Plus CD-ROM (contains student edition and audio). Partnership with POLAR Electro Inc. provides state-of-the-art activities booklet and gives you the opportunity to receive discounts on heart rate monitors. Emphasis on developing health skills with activities such as Using Life Skills, Real-Life Application, Responsible Decision Making, and Health Literacy. 70 flexible lessons provided in multiple formats: print student edition, online student edition, and StudentWorks Plus CD-ROM (contains student edition and audio). Partnership with POLAR Electro Inc. provides state-of-the-art activities booklet and gives you the opportunity to receive discounts on heart rate monitors.